The square-cut Austin A40 Farina was first introduced in 1958, when the British car industry was riding high. Even so, the styling was given to the Italian design house Pininfarina, to add some fizz to the looks of the dumpy and curvacious model that preceded it. 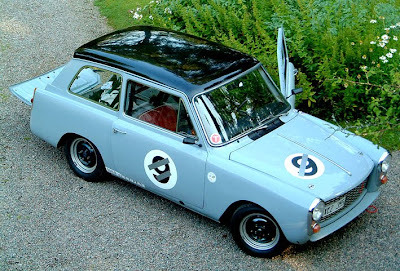 The A40 was a pretty good handler, and was entered successfully in races such as the trans-Europe Monte Carlo Rally, which was a big event of the time. Still, half a century on, the A40’s not exactly a charisma queen, though it has its followers. But for anyone who has an interest in cars of this era, Corgi’s 1:43 diecast is a pretty fair rendering of the Mk 1 ‘Countryman’ version, which can lay claim to being one of the first (maybe the first) hatchbacks on the market. 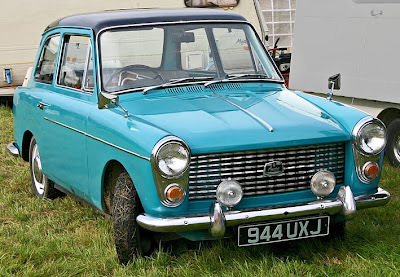 Corgi’s car has the smooth bonnet (US readers note: ‘hood’) design - the other style had twin flutes which added some visual interest - and is finished in a mid greeny-blue which matches the original shade of Sutherland Green pretty well. Should you add one to your line-up? Well, it’ll fit in nicely with a 1950s-1960s collection, and as A40 Farina models of any sort are something of a rarity, it’s probably a must-have for the completist. As for me, I’ll take a Ferrari or a Mustang! 1 Corgi 1:43 Austin A40 Farina. 2 A40 Farina showing the fluted bonnet design. 3 An A40, modded for racing work. 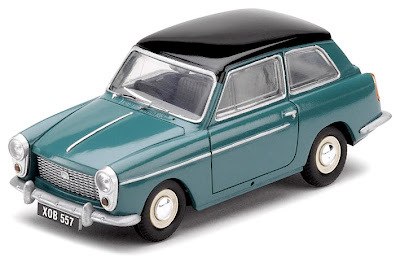 Take a look at the Austin A40 Farina Countryman at Corgi here. Corgi’s race and police versions of the A40 are also available, here.